Since my last blog post, I have been approved as a Run Director for Gravesend junior parkrun 🙂 In their infinite wisdom, UK Athletics/parkrun have processed me as an honest and trustworthy person! How little do they know! And although I haven’t actually “performed” the Run Director role yet, I have been taking on different responsibilities over recent weeks. Volunteer co-ordinator is a role I took on for the first time last Sunday and responsibilities included allotting marshal spots to our lovely volunteers and then giving them a health and safety briefing before sending them off around the course. Although not an officially recognised volunteer role, there’s also the task of leading the runners’ warm up session, all carefully choreographed and prescripted by parkrun. 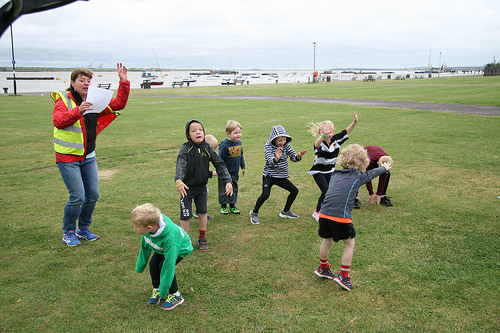 Now although I have watched this pre-run activity on numerous occasions, I was very literally dropped in it a few Sundays’ ago when our Event Director, Matt, suddenly announced I was doing the warm up! Panic or what! Fortunately there is a crib sheet and I think I managed to pull it off with the help of all the willing children I had up front assisting me. I’m not sure anybody noticed any errors but they might have thought the warm up a bit shorter than usual! Now there is a point to all this! I’m not the most confident person around and the thought of standing up in front of a large number of people and being vocal is anathema to me. There’s a reason I don’t run exercise classes (apart from my inability to count music and complete lack of natural rhythm). I’m much happier working one to one (or maybe two, sometimes three!). I am so glad Matt hadn’t told me beforehand what he had in mind because I would probably have been a blubbering wreck. So this week with a large number of core volunteers on holiday, I found myself being volunteer co-ordinator and warm up girl again but this time I had a bit more confidence – hopefully it showed! I’m still not looking forward to my first go at being the official Run Director and giving all those people the run briefing but I’m sure it’ll get easier the more I do it.